There have been a handful of popular mods adding new enemies to the game, but most of them just have a new look and are slightly more powerful than normal, or attack in slightly larger groups. 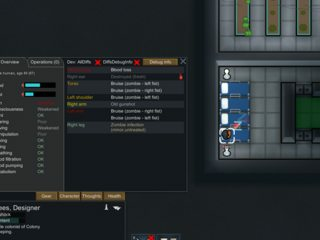 I wanted to add an enemy that has truly unique behavior in the world of Rimworld, and adds new challenges to the game when fighting them. - Their bites are infectious. If a colonist is bitten you will get an alert. 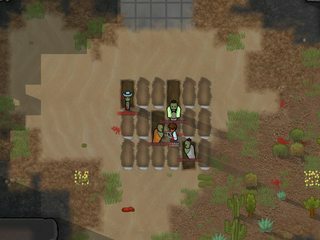 The colonist will slowly die of the bite, and then they will turn into a zombie immediately on death. - You can easily keep track of the origin of any zombie by looking at their names. A zombie that was spawned in a zombie horde will simply be named "Zombie". If the zombie reanimated from someone who was originally living in your game, their name will be "Zombie [Name]". If they were a colonist there will be a pair of "*"'s surrounding their name. - Zombie stragglers will be left behind, forcing you to leave your base to deal with them after the initial zombie attack is over. - The zombie virus goes airborne and affects all humans and corpses. All human corpses will start reanimating even if they were never bitten while living. https://www.youtube.com/watch?v=Fg2g0nLKGk4 - Gameplay footage from the Alpha 9 release of Zombie Apocalypse. 1) Just overwrite the files in the Zombie Apocalypse mod folder with the patch files. 2) Make sure you load Zombie Apocalypse after EPOE in the mods list. - The Airborne incident is now extremely rare by default, and can be disabled through the XML. - Zombies no longer attack doors. - The Zombie outbreak will now start after the colony is named, with an alert to go with it. - Reduced Zombie speed and increased health. - Rebalanced Zombie unit priorities when generating hordes. This should result in larger end-game hordes than the ones from Alpha 9, which were smaller than they were meant to be. - All strings in the DLL have been moved to XML, allowing for translations. - Updated the mod for Alpha 9. - Corpses no longer reanimate if their brain has been damaged or destroyed. - There is now a minimum of one in-game hour between when a pawn dies and when it is reanimated. This is usually only a few seconds in-game. - Zombies have been slowed to 60% of the speed of humans, from 80%. - Extended the damage bonus to zombies for cutting weapons to include stabbing weapons. - Changed the way raid sizes are determined. - Brought Zombie point cost in line with units from other factions. This should greatly reduce the size of end-game zombie raids. - Zombies now deal more damage, but attack more slowly. - Removed the extra damage taken by infected humans. Non-colonists no longer succumb more quickly to the zombie infection than colonists do. - Changed the naming scheme for zombies. All reanimated zombie names will be "Zombie [Name]" whether they were enemies or colonists. - The base chance of a pawn being bitten when struck by a zombie has been raised from 16% to 21%. - Melee skill level now reduces the infection chance by 1% per level. 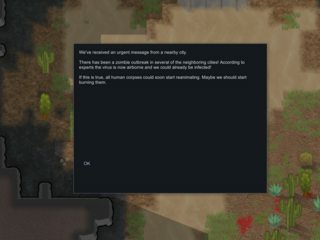 So a colonist with a Melee skill of 0 will have the base 21% chance of being bitten and a colonist with a maxed Melee skill of 20 will have a 1% chance of being bitten. - Zombies no longer take reduced Melee damage. - Cutting weapons now deal a base 200% damage to zombies, plus an extra 0-300% depending on Melee skill level. - Cutting weapons now have a base 25% chance to one-shot Zombies, plus an extra 0-40% chance depending on Melee skill level. - There is now a "Zombie Infection" disease that infects the area of zombie bites. This disease will have various detrimental effects on a colonist's health, in addition to the usual damage that the infection deals. The Zombie Infection will be visible in the Health tab of any bitten colonist. - The red blink damage effect for bitten humans has been removed. - The damage done to colonists by zombie infections has been slowed considerably to compensate for the added health debuffs. 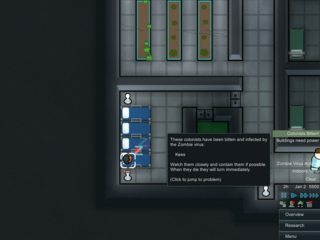 - Any bitten limb can now be amputated, curing the colonist of the infection, but leaving them with a permanent disability. This only applies to infections on limbs and parts that can be removed. - Fixed a mod compatibility issue. Now the mod should work fine with MAI. - Made zombie raids start small early-game and ramp up over time. - Increased the base chance of a traveler/raider being infected when it is spawned. - The chance of a traveler or raider being infected when it enters the map now takes the difficulty setting into account. - The frequency of zombie raids is now determined by the difficulty setting. - Updated the mod for Alpha 6. - Zombie hordes and the airborne incident no longer rely on the storyteller to happen. Instead they will happen regularly on a random timer. - Changed the way zombie horde size is determined. Zombie horde sizes will now take your difficulty setting and progress into account. - Since corpses now decay completely over time, really old corpses (the skeletons) will no longer reanimate. So this should reduce the number of zombies that reanimate from your graveyard when the airborne virus incident hits. - All non-Colonists now have a 1/500 chance of being bitten when spawning on the map. This includes both visitors and raiders. - You no longer receive warnings when non-Colonists are bitten by zombies. - The naming scheme for reanimated zombies has changed. Zombies that reanimated from corpses will now be named "Zombie [Name]" instead of "[Name] (dead)". Zombies that used to be colonists will be named "* Zombie [Name] *". - Instead of "Undefined" the game will now display "Zombie Virus Active" if the mod is running and "Zombie Virus Airborne" if the virus is airborne. - All Zombies that are not spawned in raiding parties will be given a random target search radius between 15 and 250. The old value was 50 for all non-raiding zombies. - Zombies that are spawned in raiding parties will now have a 40% chance of using that random target search radius, meaning that there will now be a chance of zombie stragglers from hordes who just hang around at the outskirts of the map and do their own thing until someone gets near them. - When the airborne incident hits, you now have 24 hours to dispose of corpses before they start reanimating. - While the airborne incident is active, a corpse will not reanimate until it has been dead for at least 12 hours. - Increased the damage that bites do over time. Bites now do 2 damage every 200 ticks, instead of 1 damage every 300 ticks. - Reduced the chance of the zombie virus going airborne to 1, down from 2. - Reduced the chance of the zombie raids to 6, down from 8. - Fixed a small issue that made the Zombies more likely to attack a turret even if a Human was closer. - Tweaked the way points are calculated for zombie raids again to guarantee that any zombie hordes that show up before 10 days into the game will only consist of one or two zombies. - Fixed (I think) a bug that was causing odd names to be generated for pawns. - Lowered the Zombie's health to 100 again. Zombie hordes are tough enough with standard HP. - Fixed some issues with pathing to unreachable targets. I don't think I got them all though. - Fixed a game-breaking bug that would cause the airborne status of the virus to carry over to a new game if you didn't close the client down before starting a new one. - Removed the delay (in most instances) from when zombies spawned to when they were turned green and renamed. - Increased the delay from when the virus goes airborne to when corpses start reanimating. - Slightly reduced the rate at which corpses reanimate. - Reduced the chance of the virus going airborne by 60%. - Completely changed the way points are given to horde incidents, making the horde size scale over time and with the number of colonists you have. - Increased the melee damage of zombies by 2 and the health by 10 to compensate a bit for their slower speed and smaller early-game hordes. Zombie Apocalypse replaces the Pawn class and all of the humanoid race definitions in Races_Humanoid.xml. Because of this there will likely be compatibility issues with any mod that also overrides the humanoid race definitions. A special thanks to Pawnstorm for helping me fix an issue that was stalling the development of the mod because I was missing something really simple. And another thanks to SacoMato for testing. Wave Survival Mode - Less grinding. Less downtime. More action! Feel free to put suggestions in this thread. Bugs can be posted here or in a private message. If you get screenshots or videos of your colonies falling horribly to a zombie horde, I would love to see them. This looks terrifying, but also with a twist of awesomeness. I wanted to add an enemy that has truly unique behavior... So I added... mindless killers [that] kill you and your enemies indiscriminately... in large hoards. Naw, I'm just messing with you, I'll give this a shot depending on how it interacts with standard gameplay, such as faction attacks/visits. Well... I guess it's time to deck all of my guys out in mini guns and LMGs... no more M-24. Or Screw it i'm Out! This mod seems amazing! Going to have to try it out at some point! I also agree with everyone else that there should be a way to save bitten colonists, even if it takes a very long time, maybe have someone with the doctor skill administer a daily cure that you have to manufacture and let it have an increasing % of working with each dose, then have to re-capture them in the usual prisoner way. Same could also work if you could trap a non-colonist npc that is reanimated? Cure them then treat them as a captured raider? 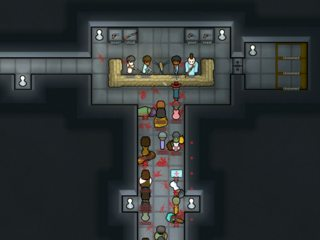 Maybe have a block that needs power and will stun any zombies in the room for x amount of time to allow colonist to administer cure, but have to charge the block for x amount of time to prevent over-using it as an exploit during zombie raids? Slow movment part isnt really that visible, just started new game play and zombie was the first encouter before even the first raider, now its all good since they dont shoot, but it took me almost 30 min to run around with my 3 colonists and trying to kill that 9 zombies. Now im aware that my colonist wouldnt hit a zombie while sticking a minigun in his face, but the pistol on the other hand is kinda good shoot and run weapon so while they are kindish slower, it still take a while to make run for a one shoot distance from pistol. Also im not sure but what is a chance of beaing biten, my colonists did take quite a beating and it was very rare for them to get biten effect. Thats my short feedback (me bittching basicly ^^) more prapobly later today. I can slow the zombies down a bit more, but I don't want to nerf them too hard early in the development. Once I get the important changes out of the way, I will work more on balance. The Zombie's speed is set in the XML, so if they are a bit too fast for you, you could always go and slow them down on your end. Just edit the walkSpeed in Defs/ThingDefs/Races.xml. I plan on doing something about the overwhelming hoard sizes early game today. I used the point system that is built in to the Raid incidents, assuming that the points would scale over time like they do with normal raids, but it's obvious that my assumption was false. There is a 1 in 10 chance of your colonists getting bitten on every successful melee attack from a zombie. I wanted the bite chance to be low since the bites are fatal. Zombies are dead, so there will never be a cure for zombification in my mod. I will, however, consider options for treating zombie bites. An ideal solution, in my mind, would be something that offers a chance at curing of the bite at the expense of permanent stat debuffs. Like, for example, Hershel in The Walking Dead survive a zombie bite by amputating his leg. So if he were a pawn in my mod he would have a permanent speed reduction. Or another person could survive the bite but never be quite as healthy as they were, so they would have a permanent reduction to their max health. And thanks to everyone who has played it so far! Don't get mad at me for stupid stuff! That is a good idea, though I think the debuffs would need to be very carefully balanced otherwise it ends up pointless saving them. I was thinking more maybe if it can be done, losing a set % of a skill or multiple skills for amount of time spent infected before cure, and if they aren't timely cured, permanentaly losing the ability to do said skill.... That could balance things quite well, reward those who have cures prepared, and those who take too long to cure end up nerfed and not able to mine etc... It would mean they could still be useful. With taking away skills they could still be useful.. If they had a speed debuff they would be almost useless at everything bar researching and maybe cleaning... The health debuff though could work well with the skills debuff but at a slower rate than skill levels lost. Will definitely give this a go today and give feedback, but I can already tell that this is going to be fun.